This is a blog about the experiences of women who train in a martial art. I want to cover the difficulties we face as women in a still largely male dominated area. This is changing and is certainly not the case in the children’s classes, where the split is fairly equal. How societal expectations, such as childcare and beauty impact our training and what we can do to change it. So it would be interesting to explore why women leave and why they stay. My ultimate aim is to encourage more women to take up this art. I’ve chosen the name Tigerlily to represent yin and yang elements. The lily flower is often associated with death and funerals, but it’s actual meaning is innocence and purity. In the case of death a return to that state. I am using it to represent the yin qualities of martial art, which are often stated as feminine and soft. Which although I’m not keen on the connations it is appropriate for a blog about women. It also embodies how the karate I study is working toward the simplicity of natural movement. 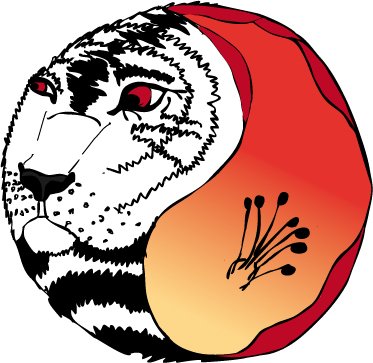 Adding tiger to the beginning, is to represent the yang, masculine qualities. Tigers also embody power, speed, tactics and a certain focus that is common to martial art training. Tigers will only fight each other if absolutely necessary and prefer to make a show of dominance, so this is similar to the martial art philosophy of learning how not to fight. A common misperception that martial arts is learning how to fight. It is actually learning how to finish a fight as quickly and safely as possible. Thanks for replying! In this instance, the woman in question was a lower rank. When I hit the bag, her expression afterwards was more surprise than anything else. She told me the impact had slightly knocked the wind out of her, yet, she was not bothered or seriously hurt. In my humble opinion, I felt as if the black belts were being overprotective. But, the woman did not hold a grudge. As a matter of fact, she slightly teased me later on, and we both laughed. I apologized to her again and she said it was fine. By the way, I’m sorry to read what happened to you with your knee during that particular training session. So it could just be because she was a lower rank rather than being female then. Thanks it is pretty much ok now and we all learnt from it. I think the fault was not yours but without being there it is hard to say for sure. As far as I’m concerned if they were that worried the teachers shouldn’t have put either of you in that situation. If we were to do an exercise like that using a student we thought wouldn’t be able to take it then we would be standing right next to them and help them hold the bag and remind the strong students to take care. Most of the time though when it comes to an activity like that we would choose the two strongest students to hold the bags. Although at some point students do have to learn how to hold pads and how to take the impact, which is actually a more important lesson than how to generate power. I have two questions for you; was the lady in question bothered or hurt and was she a higher grade than you? If she was a lower grade then going easy on her is the right advice and you build up the power to how much they can cope with. If the lady in question was not bothered or hurt, then the teachers were being over protective because she was female. My sensei has the phrase “you can’t swim without getting wet” meaning you can’t go into a full contact fighting activity without getting hurt. Having said that we do want to keep our training partners safe and unharmed, so we can train with them again. You say she is a friend of the family, have you or are you able to ask her how she felt about the situation? At the end of the day you made a mistake and apologised. There is nothing more you could have done to fix it. These things do happen and everyone should learn from it. It could be that the female black belt wasn’t chastising you but teasing you. I had a situation in 3 step ji yu with a lower grade guy who decided to throw me and I grounded instead of yielding and we injured my knee quite badly. There were three of us at fault, I should have told my training partner I have a big problem being grabbed around the neck. He should have felt me ground and realised that he shouldn’t throw me, if I wasn’t so light he wouldn’t have been able to anyway. Which meant he was using strength not skill. I should have yielded and let him throw me and the black belt who was supervising should have seen it and stopped it at that point. Some of the content on this blog will contain information and links that may be triggering to some people. Be aware as it will not be mentioned within the content, or before a link. I have done it this way because awareness is your first form of defence, and you should always be aware. You would not get an obvious warning from an attacker. I will try to tag it appropriately though, so you have some idea of content.